By now everyone knows that the Supreme Court struck down 3 of the 4 provisions of the controversial Arizona law restricting immigration. The only part that the court upheld in the 5-4 decision is that the Arizona police will have the right to check the immigration status of people held for probable cause. While this might be a logistics nightmare for the Arizona police, it stands to reason that if someone probably commits a crime, there immigration status can be questioned, since being illegal is also a crime. But what is far more interesting is Justice Scalia’s over the top rant ( dissent) on the majority (5-4) opinion. While the majority opinion, written by Justice Kennedy, recognizes the value of immigrants in American society, Scalia seems to think that all immigrants should be thrown out. He says that States kept out people that they did not like. For example the Southern States kept out black people. And he implied that if Arizona (or any other states) knew of the majority’s decision in 2012, when they joined the union, they would not have joined. Justice Scalia’s father immigrated to the US from Sicily, according to the Wikipedia article on him. Salvatore Eugene Scalia came to this country, worked hard, became a professor and subsequently sent his son, the Justice to Harvard law school. And this immigrant, Salvatore Scalia gave America an excellent ranter, which adds color to otherwise drab Supreme Court opinions. While politics has its place in the nation, politicians need to stop playing word games in diva mode over legislation as vitally important as the Violence Against Women Act. Without politicians, the nation would not have legislation, rules, regulations, Acts and Bills to govern behavior, administer the law, carry on commerce and promote immigration. However, part of the political process seems to be the love of hyperbole. Such was the case when politicians waxed elegant about the proposed changes to VAWA. Once again, a vitally important law has fallen victim to election year rhetoric, and there is no clear winner in sight. It seems those on the campaign trail feel VAWA is an issue to be used to score political points. Frankly, politics should not matter when dealing with issues like this. The issue is not what politician is better than another, nor what party is better than another. The main point of this Act is to make communities safer for women and children, not bicker over who did what to whom and how important they are for doing it. Just recently the House voted for a reauthorization bill. That vote was loudly opposed by the Democrats, who wanted a version that was considered in the Senate. The House legislation is fairly similar to the Senate sponsored Bill, with both reauthorizing programs to offer life-saving support to domestic violence victims, and the funding remains just about the same. Overall, when the two bills are compared, they are close to 85 percent identical. What is the problem? Politicians say the Senate version, by adding services for Native Americans, lesbians, gays, transgender and bisexual violence victims, is politicizing VAWA so the Republicans will not vote for it, due to the hot button issues. History shows when VAWA has been reauthorized, it is to expand unmet needs, which has nothing to do with politicians and their sexuality biases. What does have the potential to be an issue is the avoidance of the fact that some programs within VAWA may be abused with fraudulent applications by immigrants. One of the pieces of legislation lets illegal immigrants applying for, and obtain, a U-Visa to remain in the U.S. after being victimized, and makes certain they work with law enforcement to put the criminal/abuser in prison. However, they do not have the right to permanent residence, unless they are victims of aliens, and the alien is convicted and deported. Put another way, the U-Visa would no longer offer amnesty to illegal aliens just because they claim to have been a victim of a crime. It is a delicate balancing act to find a happy medium for both parties to agree upon. However, both parties are missing the real issue, and that is immigrant women and children need the support and care offered under the auspices of VAWA. They do not need political arguing when their lives may hang in the balance. Last Friday, June 15th, the Department of Homeland Security announced, following President Obama’s announcement that “dreamers” people who were brought into this country by their parents through no fault of their own, and have studied here will get a work permit under what is called deferred action. However immediately after the announcement our phones kept ringing with all types of people asking to get work permit. And I’m sure that there are lots of ‘notarios’ who are waiting to pounce on illegal people and getting their money. First its still too early to file anything. The Citizenship and Immigration Service has said that they will start offering deferred action from August 2012. Please wait for regulations to come out before handing over money to anybody. So lets make this clear. This is not a work permit for all illegal people. This is not even a green card for eligible dreamers. Its just a temporary work permit to people who meet the above categories. Filing now by anybody will hurt their case. They can be deported without ever getting the chance to come back to the US. The anti immigrant forces are up in arms saying that illegal immigrants are voting in record numbers. They point to statistics from 2005, that 3 % of 30,000 individuals called to jury duty was not citizens. And hence they assume that everyone who is illegal is probably dying to vote. First, in many states jury is selected by driver’s license rather than voter registration. Such is the case in Texas. Many permanent residents and non immigrants have the right to drive. And the jury can be called based on that. Which is why you have the question asking whether or not you are a citizen on the jury questionnaire. Second, lets face it, voting is a right, but its a chore. (Just like Jury duty). You stand in line, sometimes for hours, to vote. Yet you get nothing out of it. Yours is just one vote, it does not even guarantee that your favorite candidate will win. While I am certainly not discouraging anyone from voting, lets face it, I have not voted in every race. And so is the case of most Americans judging by the poll numbers. So why would an illegal immigrant, waste his time to vote, knowing that she might get caught doing an illegal act and be deported. Unlike working, voting does not give you money. An illegal immigrant would probably relax and sleep rather than waste her time voting. Illegal immigrants come to this country to make a living. They have nothing in their country. So they come, work and make a living. Its survival, the most basic of all instincts that lead them to work illegally. The REAL ID ACT has denied a lot of illegal immigrants the right to drive. Yet they have to, to work and to survive. And they can’t get insurance. Accidents can and do happen. And then we all share the cost. The same is true of medical insurance. And we all as a society pay the cost, instead of the illegal immigrants paying for themselves. I wish the anti immigrant organization were made to pay for this even for one day. They would change their stance and see the reality. We do keep copies of forms and petitions online in a secure server. But they are not signed copies and they are our work product only. The Employer should pay the beneficiary the Labor condition application wage or a higher wage if the employer is paying another employee with similar qualifications and experience a higher wage. Post the notice of the labor condition application in 2 conspicuous place, and document it. Yes, when you are an H-1B employee we don’t grant you the right to privacy about your wages. Although many employers hate to do this to their employees, they have to. Also they are supposed to keep the labor condition application and the Wage Determination in a file for public inspection. If the business is H-1B dependent, there are further restrictions. Not only does the business have to attest that no US Employee was fired in order to employ that H-1B employee, but also make sure that no Us Citizen was fired at an end client location. This can be done by e mailing the end client. If intermediate vendors prohibit contact with end clients, the employer should at least ask the intermediate vendor to make that request hopefully in an e mail. And finally the Department of Labor will pierce corporate veil to assess monetary damage on the individuals if the finances of the corporation and the individuals are not kept completely separate. 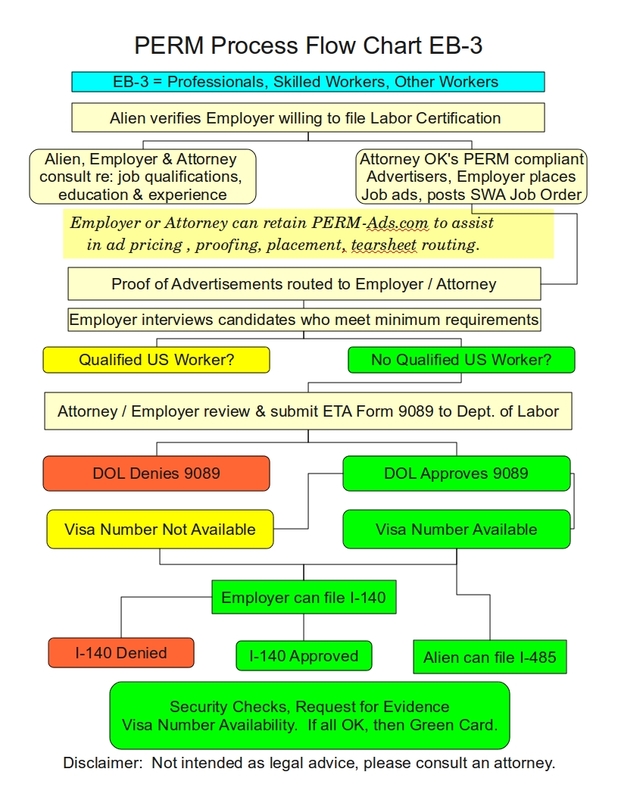 The PERM labor certification process is almost more of a mess than immigration reform. Many of the mandatory requirements do not make sense. Even trying to wade your way through the PERM labor certification process is guaranteed to create a major headache, largely because nothing seems to be consistent. Given the mess the whole immigration system is in, this might not come as much of a surprise to anymore. It is almost a miracle that anyone gets hired using this process. One has to wonder who thought up the requirements for this process, which include running two ads in Sunday newspapers with a general circulation, running two ads in a Sunday newspaper in local/ethnic newspapers, running AM/FM radio ads, posting online to job boards, taking out ads in trade journals, running employer website job postings, registering the employer at the State Workforce Authority for 30 days and so on. It is said that PERM labor certification ad placement is critical, but looking at a flow chart, which attempts to explain the process, one wonders how anyone gets hired. It’s not just the various steps that need to be taken to get things in order, line up the right documents, create and place the right ads or even make sure the regulations are met. More often than not, the PERM process is about attempting to be in compliance with Department of Labor rules and regulations. That is virtually impossible, as they seem to change from day to day and from case to case. It’s no wonder immigrants need a knowledgeable immigration lawyer to help them make sense of the mishmash. Anytime a flow chart has to be drawn up to try and explain what happens, you know the process is cumbersome and ineffective, not to mention filled with pitfalls along the way. This is a process that defies all logic and may also create an untenable situation where you may get PERM Labor Certification approved by the Department of Labor, but the U.S. Customs and Immigration Service will not approve the I-140 petition. These are two separate processes, which makes no sense, other than it provides someone with a job. The bottom line here is that if you need PERM Labor Certification, your best bet is to consult with an experienced immigration lawyer to find out what you need, what you don’t need, when you need it, where it goes and what forms you need to fill out when. It’s confusing, but the immigration lawyer deals with issues like this daily and can help you get on track.